This is the best hotel in Huay Xai and it’s priced accordingly. Average rating 6.4 from 267 reviews. The large multi-storey hotel caters to large tour groups and travellers not willing to go cheap and because of that, it’s often full in high season. The rooms come in two styles – those with views and those without. The ones with views look out over the Mekong and as the sun sets, there aren’t too many better spots to be – except perhaps on their enormous restaurant terrace. Air-con is thankfully fitted in all rooms as even in the cooler months, the rooms directly in the sun get incredibly hot in the day. Beds are topped with decent linen and the odd colourful weaving. There’s a minibar and cable TV with international channels, as well as WiFi and a guest computer in the lobby. Quite a good place, though the reception could be friendlier. This place is sometimes confused with Phonevicith Guesthouse at the slow boat pier, as it also goes by the name Houayxai Riverside. 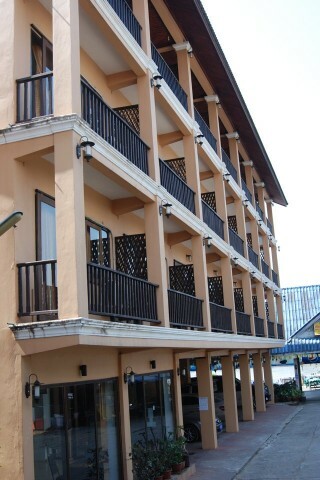 Check rates at Riverside Houaysay Hotel on Booking.com.